Can't work? Insurance denying your claim? We are here to help you! Employers pay for Workers’ Compensation insurance to ensure that in the event of an injury sustained while on the job their employees will be able to fully recover without the stress of losing their income. You shouldn’t hesitate to pursue a claim for your workplace injury! You have a right to compensation, even if you may feel you’re responsible for the accident, or your claim results from aggravating a past injury. Whether filing an initial application or appealing a denial, injured workers represented by a qualified workers’ compensation attorney have a far greater chance of getting approved and often receive more benefits than people who apply without an attorney on their side! A qualified workers’ compensation attorney will legally represent YOUR rights, will fight to get you the maximum benefits, and specialized medical treatment necessary for your full recovery. …Don’t settle your workers' compensation claim without the help of a workers’ compensation attorney! For a no-cost, no-obligation review of your case by a Workers' Compensation attorney in your area, click here. 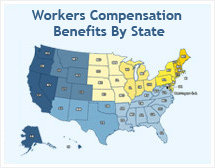 Learn whether your injury will qualify you for workers’ compensation benefits. Here’s how to make sure you get your application right. Already applied and need to know what to expect next? How long? What’s the status? Thanks for providing the free evaluation service. I was concerned that my employer was going to fight my claim. With the help of an attorney, I was able to prepare a strong case for workers’ compensation and received the help I needed for my injury.